Sudeep D'Souza: How wrong can Sunil Gavaskar get ? Being a bit busy with life and work and not getting much time to follow the cricket match - I was intently reading the sports section of today's paper and saw that India pretty much lost all hope of winning the match on Day 3. So I started to read some of the columns to understand what happened when I came across a column by Sunil Gavaskar that said "Ishant not yet ready for Test cricket". 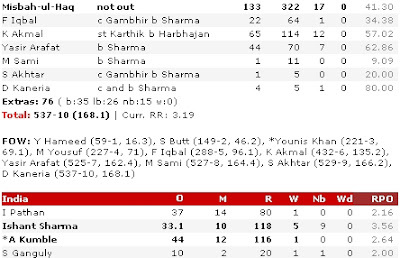 And then this is what I read at the end of Day 4 - Ishant takes a 5er. Congratulations Ishant and I hope you continue to defy all your critics. The point to note here is that commentators and columnists have to be careful about what they say and write. Ishant is just starting his career and something like this from someone as experienced as Gavaskar is totally out of line. This is not the first time that this has happened and if you have noticed they never apologize or accept that they made a mistake which makes them look bad to the public.